Friendly barman, snug pub with a sizable beer garden. I indulged in Ludlow Gold, a refreshing smooth pint. As Bluescrumpy has pointed out this Black Boy is not the one featured in the picture, that one was previously called the Bewdley Hotel, the barman was polite & efficient in a comfortable pub with a smoking area at the front, I had pints of HPA & Butty Bach both nice pints. 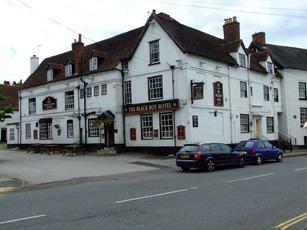 Bewdley has two pubs called the Black Boy. I will primarily review the one on Wyre Hill. Wyre Hill is a residential street away from the main road. I wasn't expecting the pub to be open on Sunday lunchtime. But it was and it was doing a roaring trade. It's a great example of a locals' pub with conversation, decent beer and bar snacks. There are 2 rooms - one at the front, with a corridor leading to a smaller bar at the rear. Listening to the conversation, I got the feeling that this has recently changed hands and things have very much changed for the better. Everybody was really complimentary about the pub reverting to a more traditional atmosphere. The barmaid (possibly owner, I don't know) was really friendly. Bewdley Worcestershire Way, Hobson's Champion Mild, Ludlow Gold & Wye Valley Butty Bach were the ales. We went for a couple of cobs. They had ham and tomato, bacon, black pudding and tomato and cheese and onion. All had generous levels of filling. They also had Scotch Eggs, sausage rolls and pork pie. The oldest and nicest pub in Bewdley. Others had better ale ranges. But I really enjoyed my visit here. 7/10. As the other Black Boy on Kidderminster Road near the river is not listed on here (although the picture above is that one), I will briefly mention it here. It re-opened last month. But it felt a bit too new for my liking. There is a large main bar and a small snug in the corner. We sat next to the open fire in the bar. Ales are Wye Valley HPA & Butty Bach, St Austell Tribute & Bewdley Worcestershire Way. 5/10 for this one. first visit and wont be the last, nice ambience and decent beer. Best pint of Abbot that I have ever had. Anywhere.